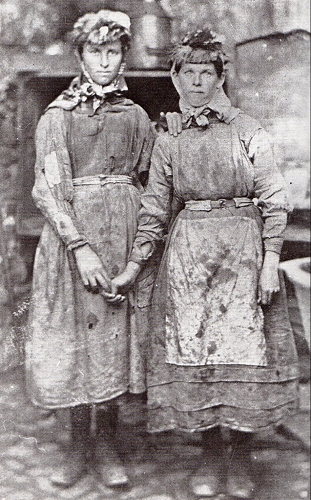 “Pit Brow Girls” working at coal mine, Wigan, 1867. From Victorian Working Women. 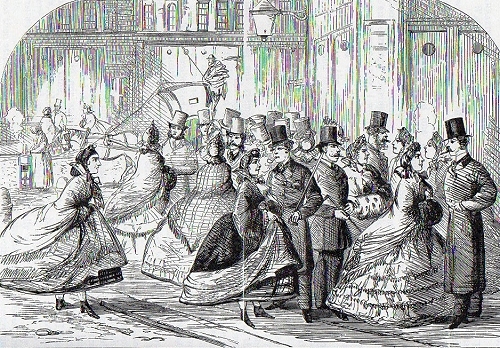 When we think of the Victorian era, we usually think of lace and silks and cashmere shawls, of crinolines and bustles. That’s because rich people can afford to have their portraits painted. They have the leisure time to write memoirs. But rich people were a very small sample of Victorian life. 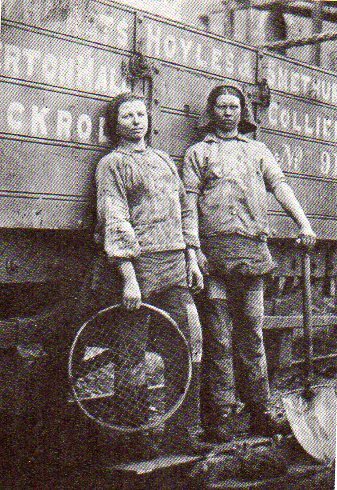 “Tip girls” (They work unloading mine refuse from rail cars onto the “tip” or mountain of coal mine waste.) Tredegar, Wales, 1865. Photo by W. Clayton from Victorian Working Women. The clothes worn by ordinary people usually get worn to rags; they rarely wind up in museums. Pictures and displays of clothing worn by the wealthy minority give us a false impression of the past. And any woman who thinks she would prefer to live in Victorian times should think again. If you want food for thought, I recommend Victorian Working Women: Portraits from Life, by Michael Hiley. 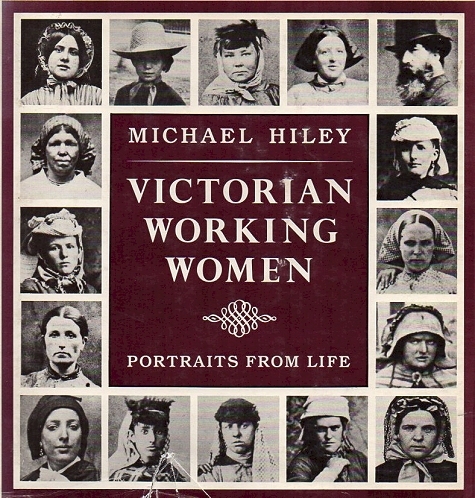 Front cover, Victorian Working Women, by Michael Hiley. We seem to be fascinated by the separate world of “downstairs” in PBS television fiction. This book has plenty of information about — and photographs of — housemaids and domestic workers. 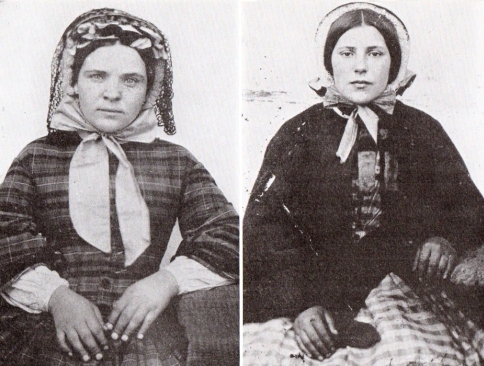 Housemaids, early 1860’s. They are dressed in their best for the photographer, but look at their hands. From Victorian Working Women. We don’t hear or see much about other Victorian women who did hard manual labor. The genteel life we picture as “Victorian” only applied to the upper classes; the lives illustrated in this book are shockingly different. 1842. 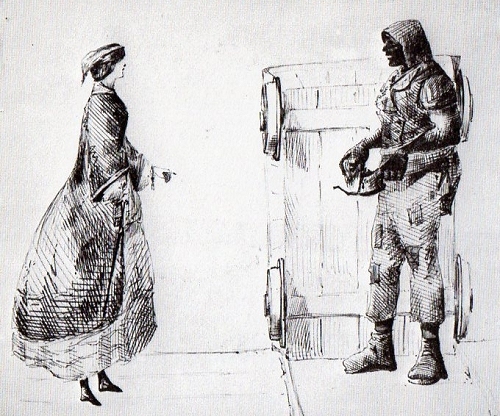 A bare-chested woman dragging a mine cart, with text from the report. From Victorian Working Women, by Michael Hiley. 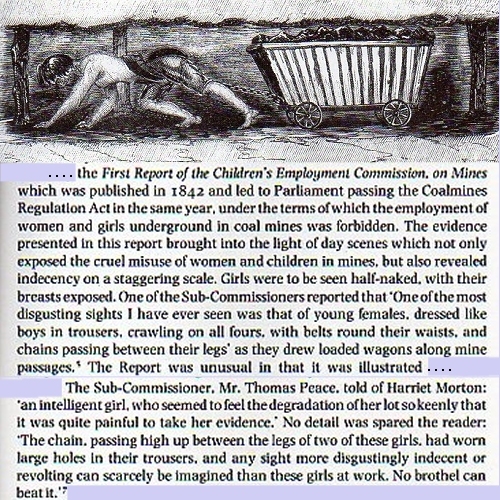 In theory, this 1842 employment report put an end to that particular form of child & female labor, but women were still working at coal mines in the 1860’s. Many were proud of their strength and ability. 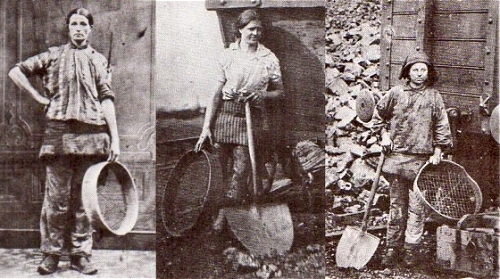 Because photography then required long exposures, these women miners were asked to pose in their work clothes inside photographers’ studios. Other jobs — hard manual labor — done by Victorian women included garbage collection, done by “dustwomen;” the streets were full of horse manure, which had to be collected. Women made bricks; a thirteen year old brickyard girl spent 6-day weeks carrying 25 pounds of clay on her head and another 25 pounds in her arms to supply the female brick molders. Women hammered hot metal into nails at a blacksmith’s forge. 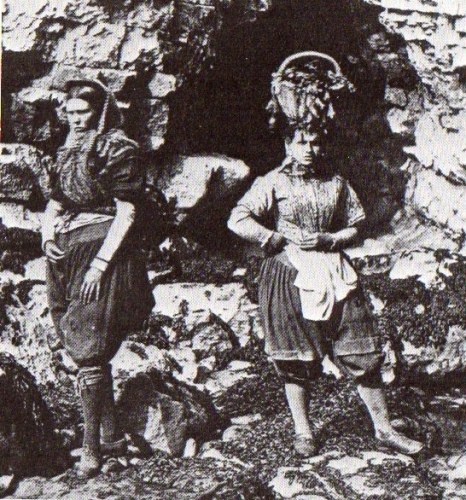 Women collected limpets and other shellfish, sometimes scaling cliffs to reach them. Milkwomen carried 80 to 100 lbs. of milk through the streets of London. 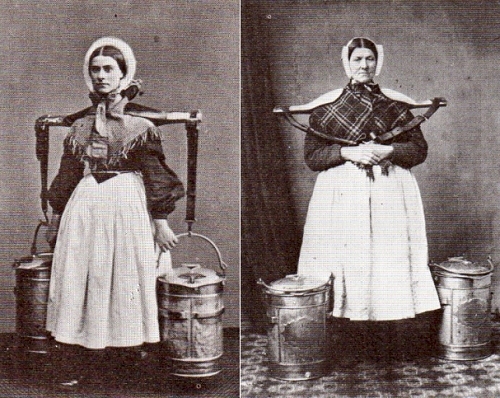 London Milkwomen in 1864 and 1872. From Victorian Working Women. Factories — including glue factories, where animal hooves and offal were the primary ingredient — also employed women. In the countryside, women were usually responsible for collecting milk (It’s heavy! ), churning butter, and working alongside men in the fields. Traditionally female jobs, like doing laundry and cooking, also required physical strength. Photo by Rejlander, 1854 to 56. From Victorian Working Women. This picture was posed in a photographer’s studio. The older woman on the left is agitating the dirty clothes in a barrel of soapy water using a wooden “dolly;” it makes me appreciate my electric washing machine. 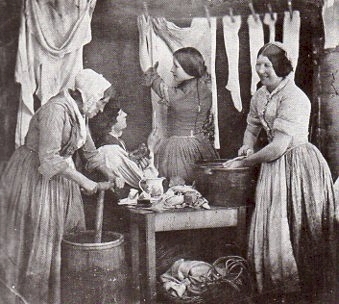 Wet laundry was heavy, so “washerwomen” had muscular arms. Housemaids were responsible for building fires in bedrooms and other rooms before the family rose in the morning; that meant carrying heavy scuttles full of coal upstairs every day. 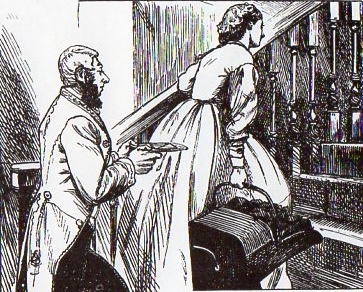 Footman carrying a tray and housemaid carrying a coal scuttle. Cartoon by George du Maurier, 1863. From Victorian Working Women. Those of us who are interested in the history of trousers for women should find plenty to think about in Victorian Working Women. 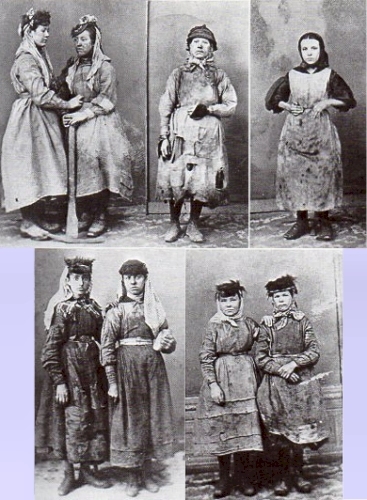 Women mine workers in trousers at Wigan, 1860s. From Victorian Working Women. 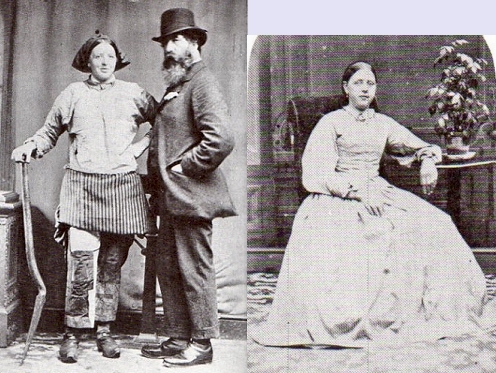 In addition to the young women dragging mine carts in the 1840s, women miners at Wigan wore trousers in the 1860’s, although this was not the case at all mines, as shown in the studio portraits above. Fisherwomen also had to expose their legs, often by pulling up their skirts into their belts and tying them around their knees. Not being women of the middle classes, their modesty was not a consideration. Yorkshire girls collecting limpets and other fishbait; 1860. From Victorian Working Women. Their skirts and petticoats appear to be tucked up into their belts in back. Hiley does discuss the indignation caused by “Bloomer girls;” but a fisher girl or a mudlark might have to expose her legs up to the thigh; class is a big element in “shock value” and notions of indecency. “Mudlark girl. Coalheaver gives her remains of his dinner. From life. 1855.” Sketch by Arthur Munby from Victorian Working Women. We owe many of these fascinating photos, sketches, and detailed descriptions of Victorian working women to Arthur Munby, who interviewed many, and collected their photographs as well as their stories. Munby stood next to Ellen in this photograph to show how tall she was. The story of Arthur Munby, barrister, Cambridge M.A., civil servant, diarist, poet, friend of many other writers and of the Pre-Raphaelite artists, popular in high society, and obsessed with Victorian working women, is almost incredible. Utterly middle-class, but not wealthy enough to cut loose from the conventions of society, Munby fell in love with a “maid of all work” — about the lowest form of domestic servant — named Hannah Cullwick. They were both in their twenties. After a chaste courtship of almost twenty years, they married in 1873, but — as much by her wish as by his — she continued to pretend to be his servant. 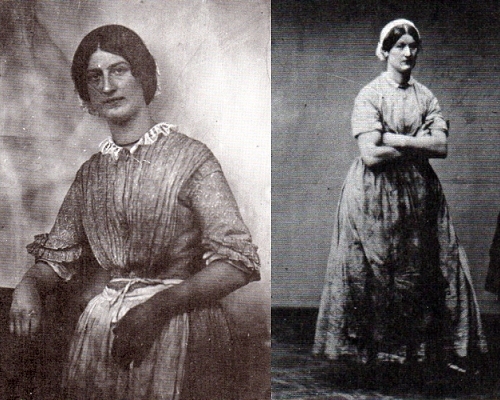 Hannah Cullwick, maid of all work; at right, Hannah “in her dirt.” from Victorian Working Women. She was strong enough to lift her husband off the ground and carry him around. He liked it. “Ours is a story that, a hundred years hence, no one would believe!” — Hannah Cullwick after her (secret) marriage to Arthur Munby. “Not so: perchance they shall both know and believe it; and if they honour her as she deserves, it is enough for me.” — Arthur Munby in his diary, May 7, 1874. Michael Hiley has drawn heavily on the Munby and Cullwick archives (she, too was a diarist.) Consequently, Victorian Working Women recounts much of this story of the bizarre relationship between two people whose lives were governed by the rules of a society which treated working women as a different species from “ladies,” although both Munby and Hannah Cullwick felt they were made for each other. 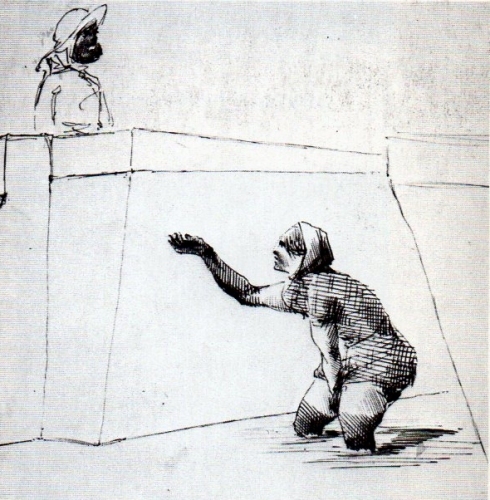 Munby was entranced by her muscular arms, her strength, her intelligence, her dignity, her “dirt,” and her voluntary servitude. (She insisted on calling him “Massa.”) After their marriage he sometimes persuaded her to eat dinner with him, instead of in the scullery, but she ate off a plate on her knees, and would not sit at the table like him. She hated being “shown” to — i.e., meeting on an equal footing — the few of Munby’s friends who were in on the secret. The Munbys could only admit to being man and wife when they traveled — where no one knew them. When they returned to London, she walked behind him and carried the luggage. This peculiar (that’s an understatement) love story makes Victorian Working Women an especially engrossing read. I confess: I have not finished re-reading Victorian Working Women, because I stayed up until 2:30 a.m. reading Munby: Man of Two Worlds, by Derek Hudson, as soon as I brought it home from the library. They didn’t teach history like this when I was in school! Victorian Working Women is for sale in used hardback or paperback for very low prices. Costumers interested in “distressing” will love the illustrations. Other books about the Munbys include Love and Dirt: The Marriage of Arthur Munby and Hannah Cullwick, by Diane Atkinson (read a review by clicking here) (It’s a very informative review….) and Munby: Man of Two Worlds, by Derek Hudson. Wikipedia lists several other publications. A PhD dissertation by Cathy Carter can be read at Google Books (click here); the introduction discusses the difficulty of accessing the vast Munby/Cullwick collection (now on microfilm), and I’m hoping to read the rest of the dissertation (but I hate reading on the computer screen….) For those of us who need to costume servants correctly, Carter’s list of sources may be very helpful. Another engrossing — and very detailed — account of Victorian working people is Henry Mayhew’s London Labour and the London Poor, in four volumes, published between 1851 and 1861. Mayhew’s interviews with “crossing sweepers,” milliners, fly-paper makers, rat-catchers, prostitutes, criminals, street sellers, bone-grubbers, cigar-end finders, and every other obscure way of scraping a living is encyclopedic and overwhelming — it’s like reading Dickens, but with more statistics. Illustrated with black and white drawings — and republished in paperback by Dover Books. Want to write a novel about Victorian London? There’s plenty of inspiration here! Read a retrospective review in the Guardian by clicking here.